I'd been driving for what seemed like hours. At the outset the trip had gone smoothly. Because we'd left home early, the roads had been largely empty. Everything was smooth sailing. We'd made good time. We'd enjoyed the scenery along the way and had brought along some CDs of enjoyable music. It was just the two of us and the trip afforded my wife and I an opportunity to chat now and then, catching up on each other's lives and compare notes on issues of the day. I knew the way to the border. The route was simple and straight-forward to follow since we'd travelled it several times before. The highways and interchanges were clearly marked. And before we knew it were were stopped and chatting with the U.S. Customs agent about our summer vacation. But now it had been hours since we'd passed the border and as we motored along nothing looked familiar. We'd made this trip to Ogunquit on several occasions, the last time being about four years ago. I thought I could make this trip with my eyes closed. Maybe I had. Maybe that was the problem. Whatever the problem, I was lost. But like all great male drivers, I wasn't going to admit it. And I certainly wasn't going to stop and ask for directions. Travelling from Canada to Ogunquit, Maine, one has to - oddly enough - drive briefly through New Hampshire and then go North into southern Maine. I'd remembered seeing the signs for New Hampshire, but that was some time ago. Where were we? I needed an indication that I was on the right highway. A hint that at least I was going in the right direction. What would I say if my wife asked me how longer it would be? If she did ask me then she'd know I hadn't a clue; that I was lost. What could I do? And then I was struck by divine intervention. It was help from above. Praise the Lord, it was...a sign. This week Theme Thursday is going with "sign". Drop by and see what other bloggers have written about this theme. The older I get, the more often I find myself driving on "automatic pilot". My car naturally seems to know where to go. But every once in awhile I panic, suddenly remembering I'm not going to the usual place, even though the automatic pilot is taking me there. It's the car's fault, of course! You drove through New Hampshire and didn't even bother to visit?! CL: I once read a story about a guy who engaged the speed control on his RV and got up and went to make himself a sandwich. Needless to say the RV didn't know the way to go...and he never got his sandwich. Moooooog: That was before I knew you lived there. When my kids were little (a long time ago) they used to call it New Hamster. I'll have to stop by next time! When I lived in NH a buddy called to say he'd be in Maine and that we should get together. When I asked what part of Maine he'd be in he replied, "Does it matter? How big can Maine be?" I told him he needed to take a look at a map. Canadian Blend: 210 mi wide by 320 mi long. Yeah, I'd say you might want to narrow it down. Oh, I just love a leisurely road trip. Even if I am to "get lost" it is well worth a drive down the road less traveled. Me-Me: Yep, there's always so much more to see and enjoy on the road less travelled, isn't there? Yep. 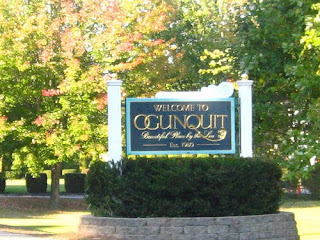 That's Ogunquit alright. Bet you were sweating that out, huh? Don: Sometimes all you need is a sign...to point you in the right direction. This sign was a sign! And what, pray tell, are you doing in Ogunquit? I think it's funny too the way I-95 enter NH, then loops around back into ME. It took me a long time to get used to that. California Girl: I'm not there now, but we often go there for summer vacation. Lovely spot. Ha! That's pretty funny. My wife were once on our way to Wichita, Kansas when we got lost and ended up way off course in Oklahoma. We never did figure out that happened. Getting a Garmin may have saved our marriage, although we still get lost even with it on the dash. Haha . . .I did a similar thing a few weekends ago and somehow just followed my nose to until I saw a familiar sign! Baino: A-ha. It was a sign! what is it that stops all of you guys from asking for directions? :) at least you found your sign before needing to admit to being lost. Jaime: Real men don't ask for directions...it's a mental defect they have.